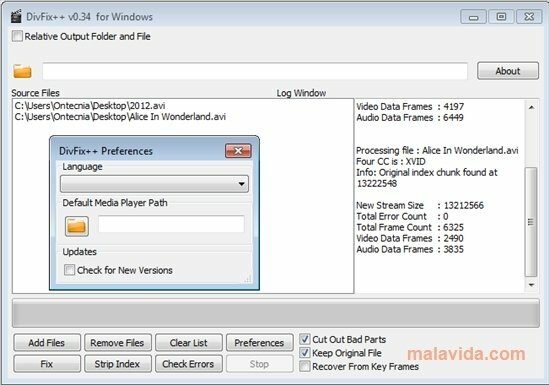 DivFix++ is a simple tool with which you'll be able to recover the videos in AVI format that you can't play. On many occasions, when you download a film, and there's a small interruption in the download, the resulting file is damaged, and you can't play the video. Instead of deleting the file, now you can try to fix it with DivFix++. How it works is very simple: you only have to drag and drop the file on the application and click the Fix button. In a few seconds the video will be repaired, it will save it in the folder that you indicate, and you'll be able to watch it. DivFix++ manages this by cropping the parts of the file that can't be used. Furthermore, DivFix++ allows you to check beforehand to make sure that the file is really damaged, or if there is another problem. An added bonus is that this tool supports AVI files that are bigger than 2 GB. If you have downloaded a film and you can't play it, instead of deleting it, try out DivFix++. Repair the file and you won't have to download it again.